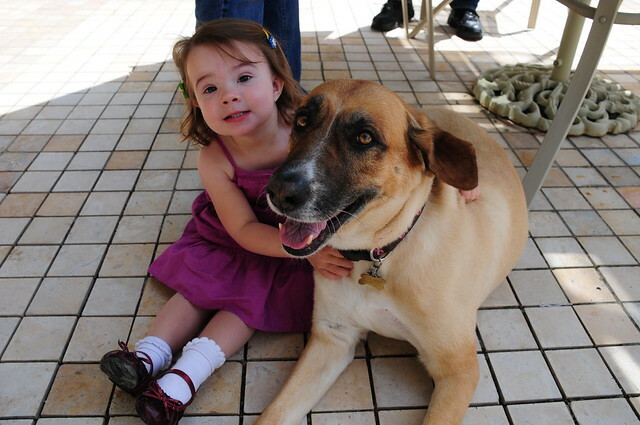 More than ten years after we took Maggie home from the shelter, our dog passed away yesterday. She had been sick for a while, she had trouble moving and she was very weak. So yesterday afternoon, I took Maggie to the vet and stroked her fur and thanked her for taking such good care of us while the doctor helped her go comfortably. This morning was jarring, because she wasn’t there to spring up from her bed desperate to be let outside. To be honest, it’s been a long time since she did much springing. Arthritis has kept her hobbled, sometimes terribly, but she always stayed by our side. Maggie wanted nothing more than to be near her people. 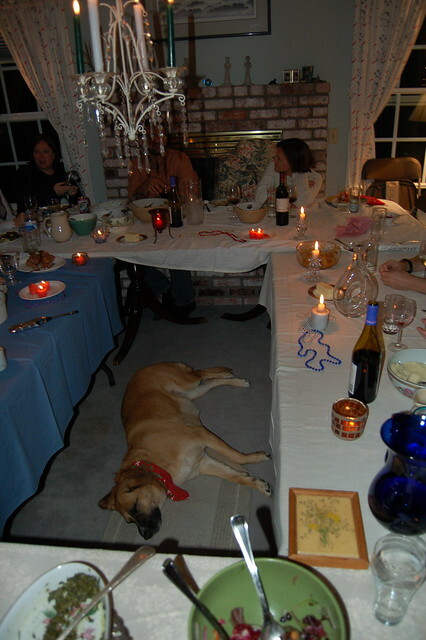 I kept thinking of a Christmas dinner, at my parents house, when we had all the tables joined up in a circle and Maggie spent the entire evening laid out in the direct center, exactly equidistant from everyone in the family. I don’t think she’d ever been happier. I spent a lot of time crying yesterday, but this has been particularly tough on Abigail. Maggie has been a constant in her life since the beginning. 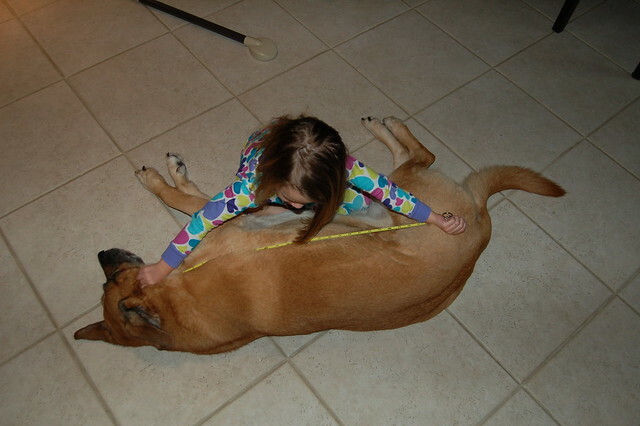 And Maggie was a great dog for kids. 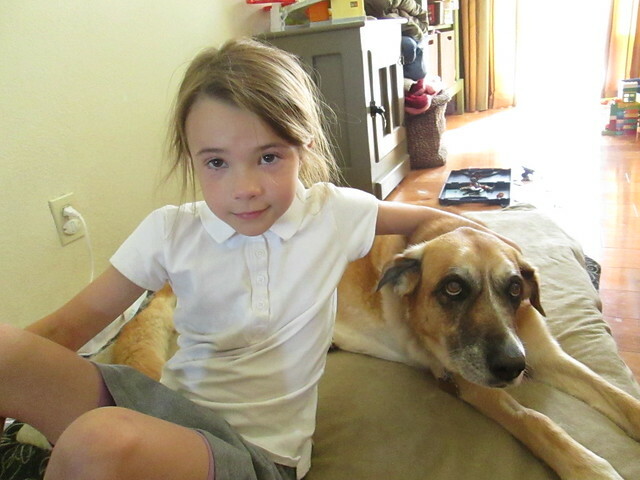 She was calm and loving, and most importantly for a family dog, she was tolerant. Yesterday, Abigail took this picture with Maggie. Then we helped Maggie into the car and Abigail sat in the back for a long time with her arms wrapped around her dog. Gabe is only three, so I’m not sure he quite understands what’s going on, although he had a few questions, too. 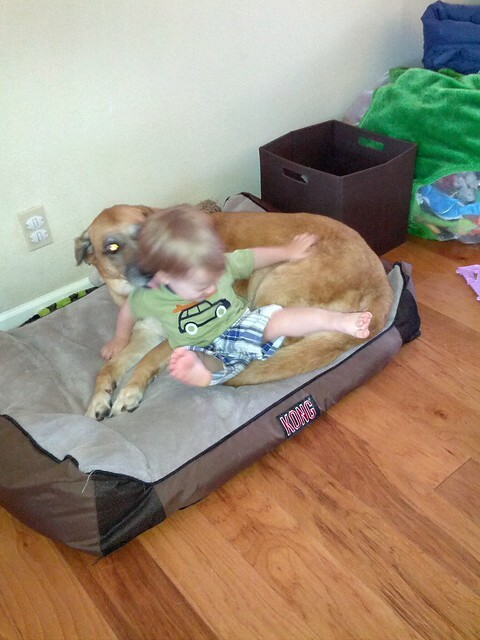 Who could forget Maggie’s incredible display of self control, when all she wanted to do was lick the baby? But Maggie was more than just a playmate for the kids. She was our dog. She would protect our house loudly against any visitors or packages that might need delivering. She was an irritable pirate. 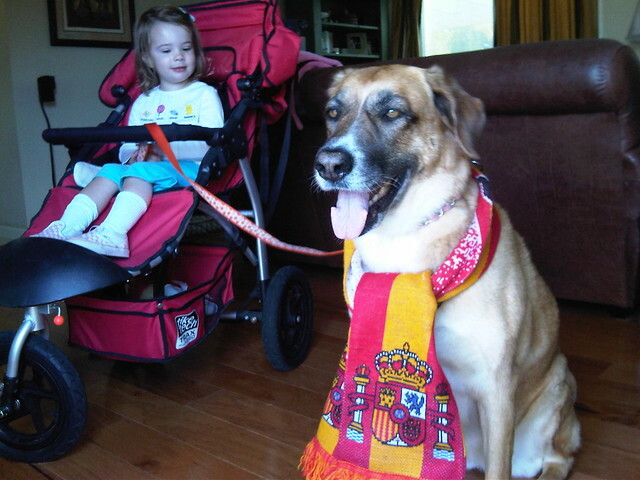 She was a big fan of Spain, and was particularly enthusiastic when they won the World Cup. She was an emergency landing pad. 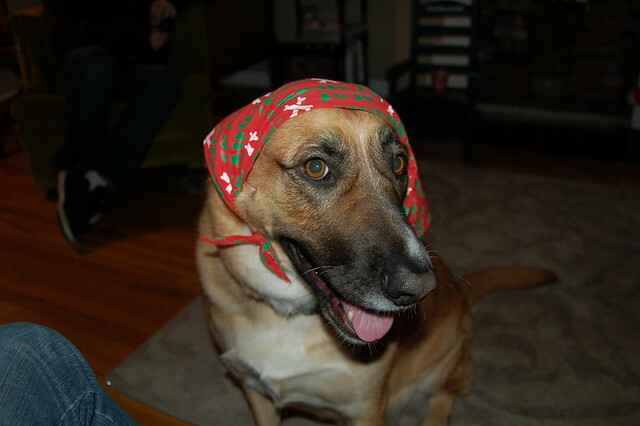 She was, of course, a Christmas babushka . But most of all she was our dog. We were so happy to have had the chance to be her family. We miss her very much. And now I’m going to let a much younger Abigail express exactly how we all felt about her. 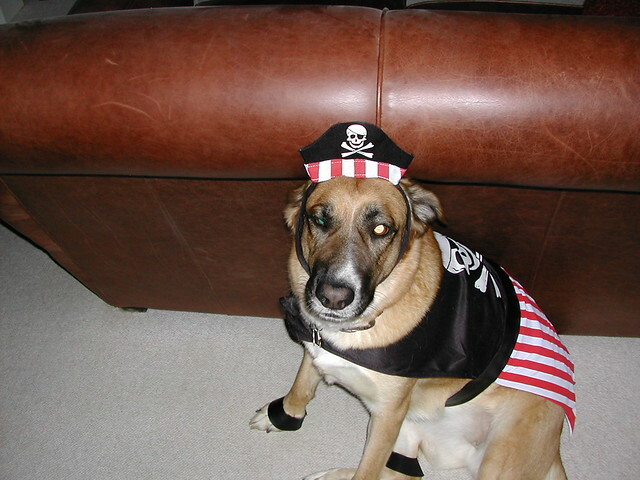 This entry was posted in Abigailia, Gabriality and tagged Dog, Maggie. Bookmark the permalink. Your Maggie article is so beautiful, and the pictures with Abblita are so precious. Sorry to hear that , love the bandana babushka ❤️. All dogs go to heaven, I got tears just knowing a little about her . Sending your family love , we never want to say goodbye but they always happens. So sweet Alexi! Much love to you and the family. So touching and beautifully written. Hard times, I am sure, but it sounds like she had a wonderful relationship with all in your family.